In an interview published Thursday Tony Blair said that would begin working as a Middle East envoy immediately and travel to the region as early as next month. The former British prime minister said that his work would consist of preparing the ground for a future Palestinian state, something he said would be essential for a negotiated settlement in the region. "It is a fundamental issue - I will be starting straight away," he told The Northern Echo, a local newspaper which serves England's northeast. "I will probably go out in July." During his tenure as prime minister, Blair repeatedly said that the resolution of the Israeli-Palestinian conflict was key to achieving peace in the wider Middle East. 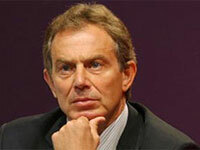 In the interview, Blair said that the issue was a matter of concern "anywhere you go in the world." "This is the issue which concerns people, not merely because of the plight of the Israelis and the Palestinians, but also the symbolism of the dispute, what it says about the state of the relationship between the Western world and the Muslim world and between different cultures and religions," Blair said. Talking about his future, Blair also outlined plans for an interfaith foundation.